How dangerous a thought this was. The first 11.7 miles – all road – to Polo Fields were uneventful; I arrived at 11:01 per mile pace. I felt great and left my socks and shoes on. My new foot-care routine was paying off! While the terrain changed from roads to single track and bridle trail, the next leg was also non-technical. I opted for a sock and shoe change at mile 20.7, Shadow Lake, after stream crossings left my feet soaked. I would see my crew next at mile 37.4, Meadows Aid Station, after eight hours of running. The run felt uneventful, “smooth-sailing,” and I was feeling great, almost shining with the sun as I ran. The terrain became more technical as morning turned to afternoon, but it was flat enough to feel “easy.” It felt like a midwestern state. With my lower body healthy and no real expectations coming into the race, I was pleased with my time. Expectations in training are bars we construct for ourselves and place over the windows of opportunity. We build these bars out of past experiences; you know what you’ve done in previous training sessions, so ‘expect’ something similar. ‘Expect’ speed or strength to be like yesterday, the day before, or last week. Expectations are self-limiting thoughts; they give us a way out, a time to quit. “I expected to do this much, and it’s done.” Imagine the potential missed by adhering to expectations. Rather than ‘expecting,’ I offer two options. Option one is acknowledge expectation when it arises and plan an ambush. At some point you will say, “I could probably do…” or “Today I will…” When you speak these words, the ambush is set. You are prepared to kill. Think ahead to the point when the expectation will be fulfilled. Is it after the eighth interval, fifth set, or hundredth squat? When that moment – the initial expectation – comes, keep going. Crush the expectation. This ambush on expectation instills a revolution of thought to go farther in other areas of your life. Option number two is let go of expectations for unfamiliar terrain and experience. Participating in your first ultra-endurance event? Abandon expectations. Why not evaluate possibilities through circumstances? Step back. You’ve never been here. Why did you expect anything? Focus on the end, the actual goal, rather than reminiscing expectations for something novel. Mental fatigue is real; if you cannot plan to ambush and crush expectations, abandon them. Experience and learn. 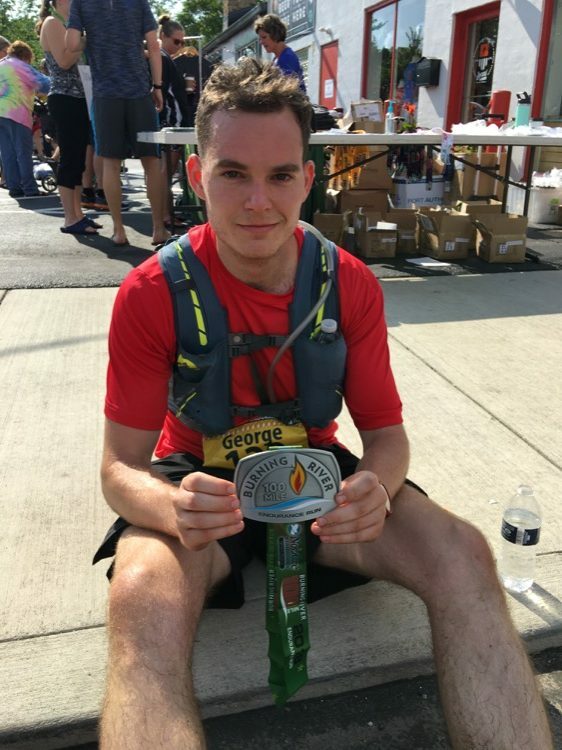 I came into Boston Mills Aid Station after running for 11 hours 33 minutes and 20 seconds. My pace was 13:57 per mile. Starting the back half, I had my first low point of frustration. Thanks, Ohio and Erie Canal Towpath Trail. I wasn’t the only runner agonizing over towpath. Perhaps it’s the monotony of the terrain, or the sun exposure, or the elevation distortion. I walked a bit more than necessary on this stretch and took note of my frustration. 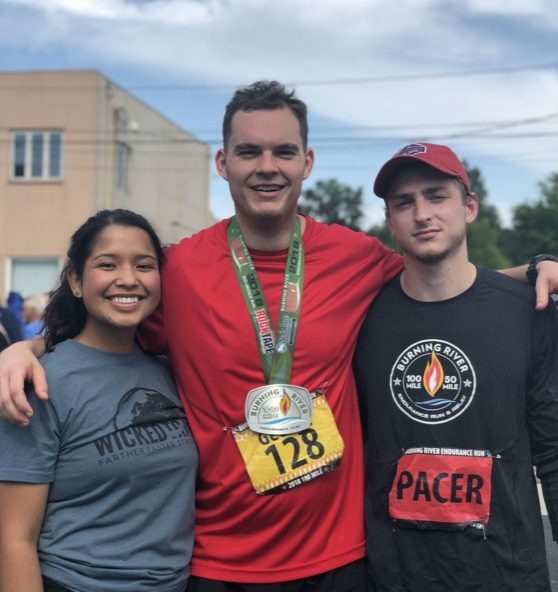 I texted my mom at mile 61.2, 15 hours in, and told her it would be “slow rolling.” Just over an hour and a half later, as my pace decreased to 15:21 per mile, I saw my crew again at Ledges. The monotony of the terrain leading in drained my mind; I was ready to see my crew. 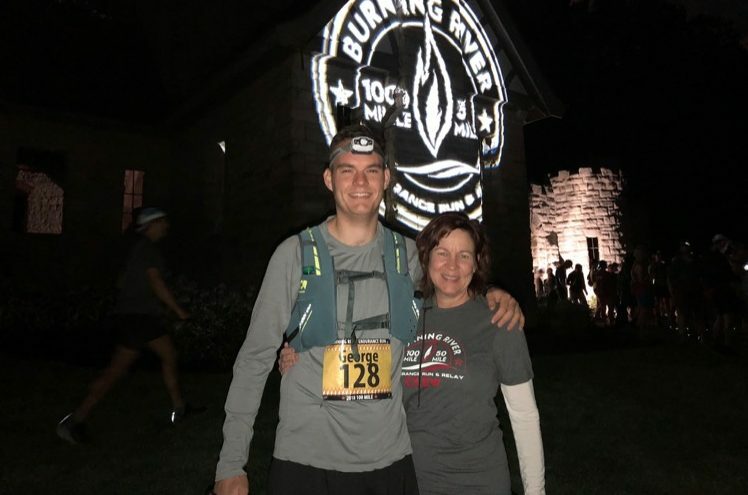 Ledges Aid Station of the Burning River 100 was the last time I felt confident in finishing. 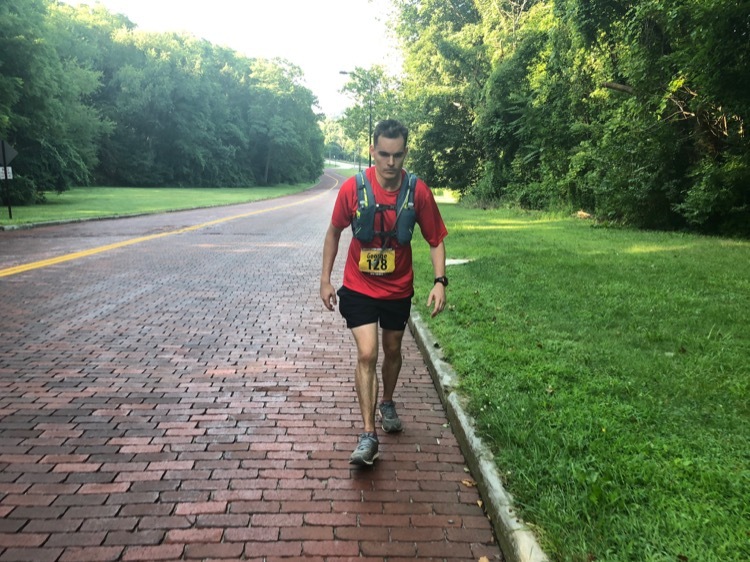 It was when the course changed for me; I would race the clock for nearly 30 miles, fighting frustration and pain the entire way. My “expectations” for the state of Ohio were shattered after Ledges. This wasn’t a mountain race and no, the terrain wasn’t advanced. But those hills destroyed me. They knew I was coming; they knew my downhill technical skills were weak. The hills, the steep climbs and wicked descents, saw their opportunity when darkness fell. I added 53 seconds to my pace from miles 66 to 71.8. Add one minute on your pace every six miles with 30 miles to go and you might be in trouble. I felt strong moving over a dark and technical 3.8-mile loop and only added four seconds to my pace. When I arrived back at Pine Hollow, the beginning and end of this loop, I started to do math. “Don’t do math,” my mom said. I couldn’t help it. The terrain was becoming rougher. I took personal inventory and knew my right ankle was getting bludgeoned on downhills. My teeth chattered in the chilly night. Estimated time of finishing: 28 hours. The people I dragged into this didn’t think I was going to make it. Neither did I. I’ll take some towpath now, please. A dark and painful six hours of hiking uphill and limping downhill, exhaling through gritted teeth, and I saw my crew again 16 miles later. I remember the Covered Bridge Loop well; it was exhausting and technical. The hills of that loop done, we left the pirate-themed station, abandoned my primal stick hiking poles, and headed away from mile 85. My girlfriend encouraged me to run, but the distance seemed insurmountable; the pain was too real in the morning darkness. Fighting back frustrated tears, I continued shuffling along. Where are the other 100-mile runners? The physical pain and mental torment experienced in an ultramarathon parallel the journey of life because life prescribes these on its own. Tears, sweat, blood, frustration, pain; this is life. Running an ultramarathon beats life to the punch. Life didn’t prescribe the pain, the runner did. Life doesn’t pull the pain away and deliver success; the runner does! Participating in life’s mischief –the rollercoaster of its pains and joys– through ultrarunning beats life to the punch. Do not be a victim to life. Do not wait to be pulled off the precarious cliff. Jump off. Do not fear the dark forest. Run into it. Do not sit idly as life robs you of comfort. Reject comfort! My lowest point, the epitome of life’s mischief, came upon being told it was only another mile to the next aid station. 45 minutes later, I was still shuffling down dark trails. Every turn teased my imagination, played with my emotions. I remember stopping during this 45 minutes ‘one mile’ section, putting my hands on my knees, and breathing in the frustration and the pain. I was in disbelief of my time and how far I had come, but still had to go. “Let’s go. You will finish,” my pacer said as we took off. Ten miles to go, I was a pale shadow of the runner who started 27 hours ago. We set off down a smooth, asphalt, wicked trail. My projected finish time at Botzum Parking was seven minutes after the cutoff. How much time did I waste at aid stations? How many times could I have run through fatigue, like on the towpath after mile 50? How many times did I pause to rest, stretch, or let someone pass? The next ten miles defined the race. Something switched in my mind. I knew it wouldn’t be easy, but I decided anything less than everything was not enough. This real conversation in my head made me run when I knew I couldn’t, when I didn’t think I would make the cutoff. I decided now I did not mind. It did not matter. Pain, fatigue, fear all vanish with decisions. I was the last finisher across the line. I finished with 9 minutes and 17 seconds to spare. I didn’t think over one hundred miles a minute here or two minutes there meant much. They meant the world. They meant completion. They could have just as easily meant failure. It’s always a decision; if you do not decide promptly, however, the chance may not come again. Decide now, and in every challenge you commit to, to finish. Decide to be strong, to quiet the voices of negativity. Decide to be great.